I decided I am actually going to try to catch a carp. So I was curious what size hook recommended and what bait selection. I had decided on my own to put some whole kernel corn on a number 4 treble. Also picked up a package of magic bait carp bait at Walmart. So are these good selections? When I was a kid we caught some carp while perch fishing on earthworms. Last edited by HumanSeine; 01/04/19 08:12 AM. I personally do not like to use treble hooks as they can damage a carp's mouth. I would definitely check out the euro-style methods involving pack baits and hair rigs. I will say that's a bit more involved and may be a little overwhelming to a newer carp angler so "just starting out" I would try a sliding sinker rig (aka carolina rig) with a size 8 octopus hook loaded with corn; don't skimp on hook quality, sharp hooks are super important! For chumming you can go a couple different routes - just throw handfuls of corn to the area you're targeting OR prepare a simple pack bait mix with common household ingredients like oatmeal, bread and some corn (use water to knead the mix to the point where you can create balls but not too much where it becomes like slop) and pack a golf ball size amount around your sinker. 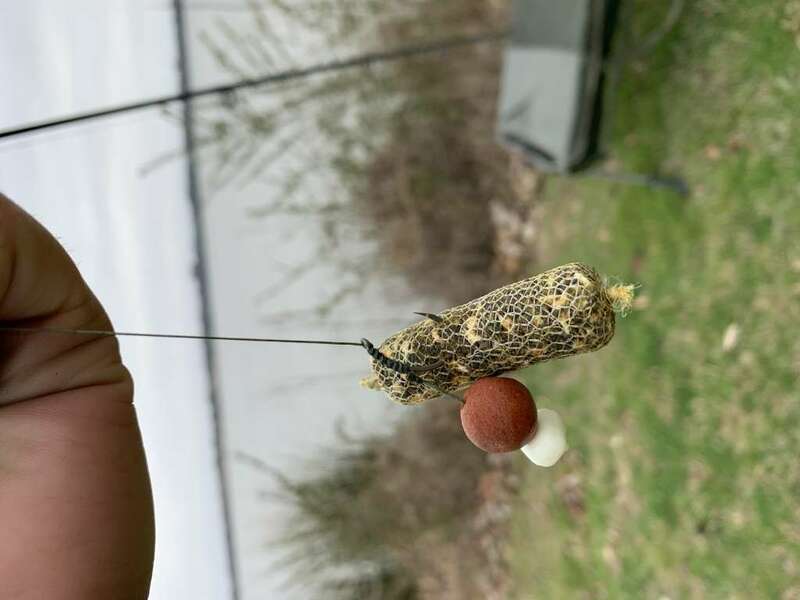 You can also still try the above setup with a hair rig instead of loading a hook with corn - it's really not difficult to tie once you practice a couple times and there's loads of videos on YT on how to tie them. They're very effective but again hook quality is important. My PB common was a 20+ lb river carp caught on a size 12 Korda Krank hook... despite the long, epic battle it didn't bend out or move at all in the carp's mouth. Last edited by MiggyFishing; 01/04/19 02:16 PM. Good advice Miggy. I haven't used treble hooks in years due to the potential damage to the fish. I use a size 6 hook on a hair rig. Corn is always good, but I use flavored garbanzo beans most of the time. If I have 3 rigs out, 1 will have corn and the other two garbanzos. Not only do treble hooks damage the fish, they also don't give as good of a hook hold! When used in conjunction with the hair rig, single hooks get many more hookups and better holds than trebles every time. Carolina rig, Size 8 octopus Gamakatsu hook, 2 cans of corn a little vanilla. For chum I just mix some quick oats and cream corn. Keep it simple until you are ready to learn the Euro styles. Last edited by BigPoppa007; 01/04/19 07:01 PM. MiggyFishing couldn’t be any more right. Euro method can be confusing at first but fascinating all together. On the flip side of the coin, here is some exposure to some baits you can find on the internet that are specialized for carp fishing. this website. This is an online retailer in Oklahoma with some of the worlds best gear for the right price. Great people and great customer support. I am currently using a hair rig with what euro tackle calls a boilie, and a plastic fake piece of corn. I also use PVA which is a water soluable plastic or mesh that allows you to pack bait into the bag and cast it attached to your hook. This ensures your hook to lay on the bottom in a pile of tasty morsels. I will attach a picture to give you an idea. Learn how to make a method mix and pre-bait before you fish. That is my advice! Last edited by NTXAndrewK; 01/14/19 09:04 PM. A good way to start is a number 6 or 8 owner mosquito hook with several pieces of sweet corn. chum with a mix of sweet corn and hominy. a small split shot to cast out.